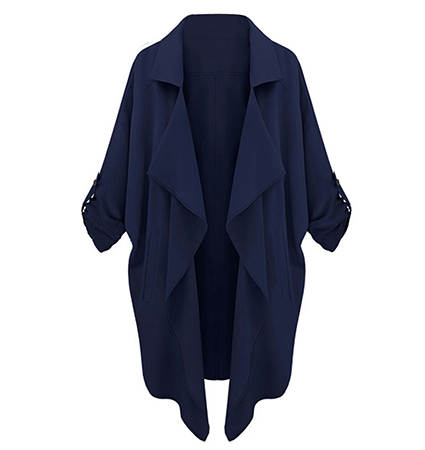 This is a women’s over wrap jacket that is long and figure flattering to disguise any figure flaws that you might have. The length almost reaches the knees. It features a notched, pointed collar and lapels that gently unfold down the front of the garment. It has three quarter length sleeves that are held securely in place by attached Epilates. The wrap is presented in you choice of navy, black or blush. It is a machine washable garment that can be tumbled dry. It is presented for purchase in sizes Medium, Large and Extra Large.